After a sumptuous breakfast at your hotel head towards exploring Delhi. Visit various tourist sights such as Red Fort, commonly known as Lal Quila, is the largest monuments of Delhi. It is one of the most beautiful forts of the Mughal era built by Shah Jahan, the Mughal emperor. The construction of the fort was started in the year 1638 and was completed in 1648. The fort has up to two kilometers of walls which are as high as eighteen meters. In 1997 UNESCO declared it as a World Heritage Site. Jama Masjid – It is one of the largest mosques in India and famously known as Masjid-i Jahan-Numa. It was built by Mughal emperor Shah Jahan between 1644 and 1656 AD with three great gates, four towers and two 40 m high minarets constructed of strips of red sandstone and white marble. The courtyard can accommodate more than 25,000 persons. Qutb Minar – The tall minaret was constructed in 1192 by Qutab-ud-din Aibak and famously known as “Tower of Victory”. Qutub Minar is a World Heritage Site and has survived the ravages of time impressively. The Minar of Delhi is surrounded by a lush green garden, which is an ideal leisurely place for visitors. Humayun's Tomb – It is the tomb of the Mughal Emperor Humayun in Delhi. The tomb was commissioned by Humayun's first wife and chief consort, Empress Bega Begum, in 1569-70, and designed by Mirak Mirza Ghiyas, a Persian architect chosen by her. It was the first garden-tomb in India, which inspired several major architectural buildings constructed on later stage. After breakfast, check out from the hotel and drive to Jaipur. On arrival, you would be transferred to your hotel. You can either choose to spend the rest of the day relaxing in your hotel, or visit the nearby surroundings. Jaipur has many well-known bazaars from where you can buy souvenirs and traditional items. Overnight stay in Jaipur. After breakfast, proceed for sightseeing tour of Jaipur. 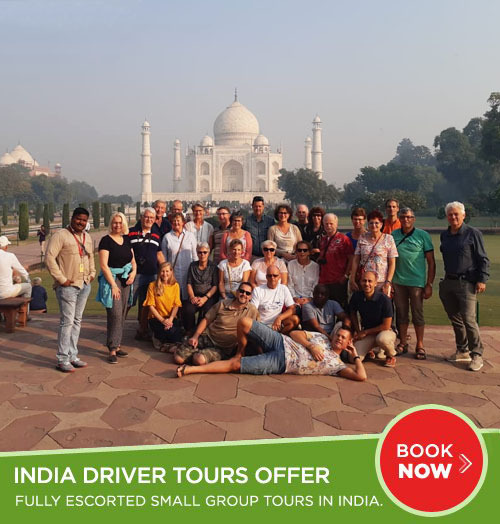 Visit the most famous tourist attractions which include Amber Fort – it is also called as “Amer Fort” and attracts huge number of tourists from all across the globe. This fort overlooks the Maota Lake and was constructed in the 16th century by Raja Man Singh I. Jal Mahal is a water palace that is situated in the midst of the beautiful Man Sagar Lake in Jaipur City. Jal Mahal is an exceptional structure of the Rajput culture. The palace and the lake around it were renovated and enlarged in the 18th century by Maharaja Jai Singh II of Amber. The wonderful five storied building built in red sandstone. Jantar Mantar, which is the largest and till date best preserved observatories which was built by Jai Singh. Hawa Mahal is considered to be the most prominent landmark of Jaipur. 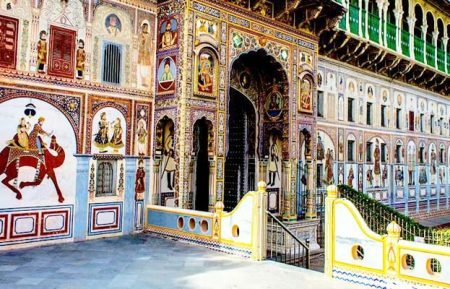 This palace comprises of around 953 small windows and was built by Maharaja Sawai Pratap Singh in 1799. Also visit City Palace which houses museum, Chandra Mahal and Shri Govind dev temple. Overnight stay at Jaipur. After breakfast at the hotel, drive to another historical and romantic city - Agra. En-route stop at UNESCO World Heritage red sandstone complex of Fatehpur Sikri is a fascinating ghost city built in the 16th century. Visit Buland Darwaza, Diwan-e-aam, diwan-e-khas. Then continue drive to Agra. On arrival, check in to the hotel. Evening at your leisure. Overnight stay at the hotel. After breakfast at the hotel, you will proceed for a city sightseeing tour. Visit the Agra Fort – the majestic and royal red sandstone fort which is built on the banks of the holy river Yamuna. The construction of this fort was started in the year 1566 by Emperor Akbar. Next visit one of the seven wonders of the world, Taj Mahal. It is considered to be the most beautiful expression of love ever made for someone. Almost 20,000 workers labored for over 15 years to build this memorial for the loving wife of Mughal emperor Shah Jahan. Overnight stay at Agra. Please Note: Taj Mahal remains closed on Friday. You can again visit Taj Mahal at the time of sunrise. After breakfast at the hotel, begin driving towards Varanasi. On arrival check in at the hotel in Varanasi. 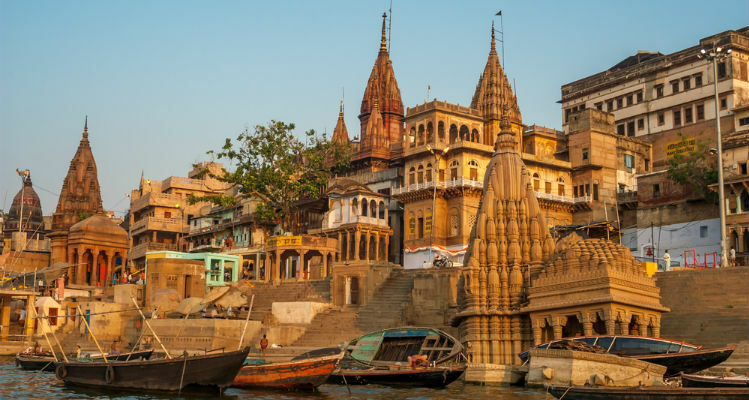 Overnight stay at Varanasi. 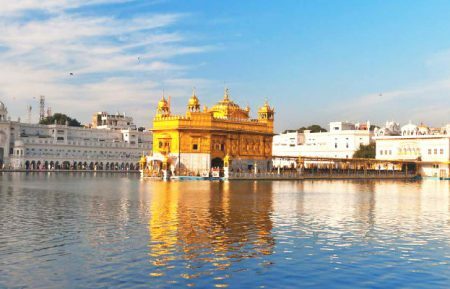 Sightseeing tour of Jaipur - The Pink City, visit the Amber Fort, Jal Mahal, Jantar Mantar, Hawa Mahal and City Palace in Jaipur. 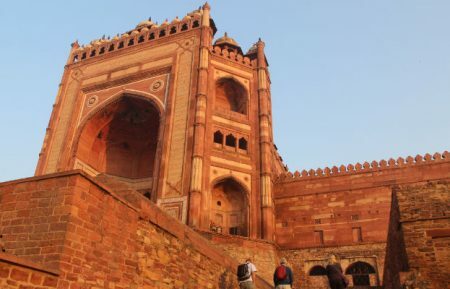 Explore the beauty of Fatehpur Sikri — an Indian ghost town. 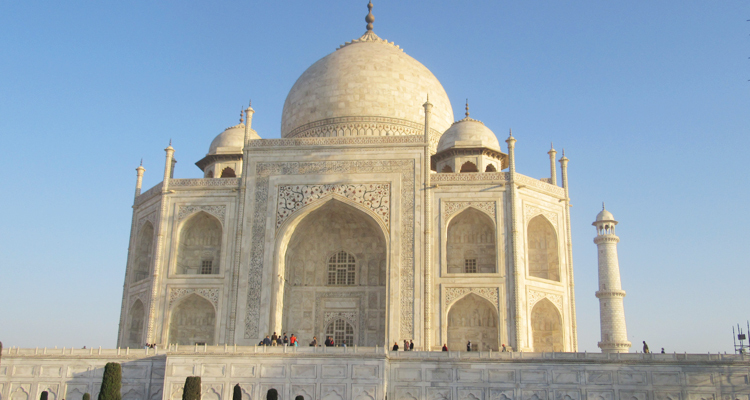 Visit the Taj Mahal, Agra Fort and other sightseeing places in Agra. 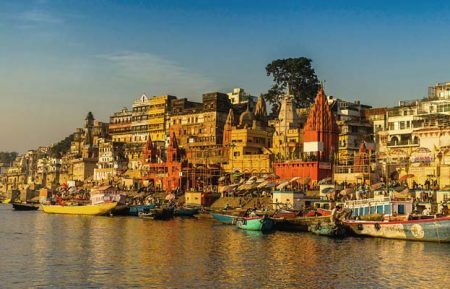 Visit Kashi Vishwanath Temple, Sarnath and enjoy a boat ride and the exciting evening Aarti at the Ghats of Ganga, Varanasi.